Primary Ignition | Comic Books and Pro Wrestling. Why? Because they're awesome. As it happens, the high visibility of the trailer gives me a chance to spotlight an artist I’ve had my eye on for awhile: Gabriel Soares. A 3D cartoonist from Brazil, Soares puts a lot of great detail into his work, while still keeping things in that exaggerated cartoon realm. Even if it’s only slightly so. To illustrate, I’ve included his takes on the Jack Nicholson, Heath Ledger, and Jared Leto Jokers. Soares’ work can be found on ArtStation, as well as his Instagram. This entry was posted in Astonishing Art and tagged 3D Art, Astonishing Art, Batman (1989 film), comic book movies, comic books, Gabriel Soares, Heath Ledger, Jack Nicholson, Jared Leto, Jared Leto Joker, Joaquin Phoenix, Joker (2019 Film), Joker trailer, Nickelodeon, Rob Siebert, Suicide Squad (2016 film) on 04/16/2019 by primaryignition. You know what? This one actually turned out to be pretty good. Probably the best since Wrestlemania 31. As always, the show was too long. Once we got into the last few hours, I really started to feel it. Mind you, I didn’t even watch the pre-show. I went straight into the main card. But the show dragged a lot less than it usually does. They seemed to be trying to move things along fairly quickly. So at the very least, we can call that an improvement. Seth Rollins def. Brock Lesnar to win the WWE Universal Championship. These “impromptu” matches usually feel pretty forced to me. Especially when they have all the graphics and the music cued up. But if you put that aside, this was a really hot start. Certainly not what anyone expected to open the show. And it was consistent with most of Brock’s best matches in recent years: Hard hitting, quick, and to the point. AJ Styles def. Randy Orton. This match definitely benefitted from the hot opener with Lesnar and Rollins. The crowd was still up and buzzing, especially in the early going. That superplex from Orton to Styles was insane. They got half the rotation before they even started falling backward. A thing of beauty. Not the finish I expected. Assuming Kofi would be winning the WWE Championship later in the evening, Orton would have made a great challenger for him straight out of the gate. Can’t say I’m offended, though. Even years later, I’m still amazed at just how much stock WWE has put into AJ Styles. He’s been a top guy almost from the start. 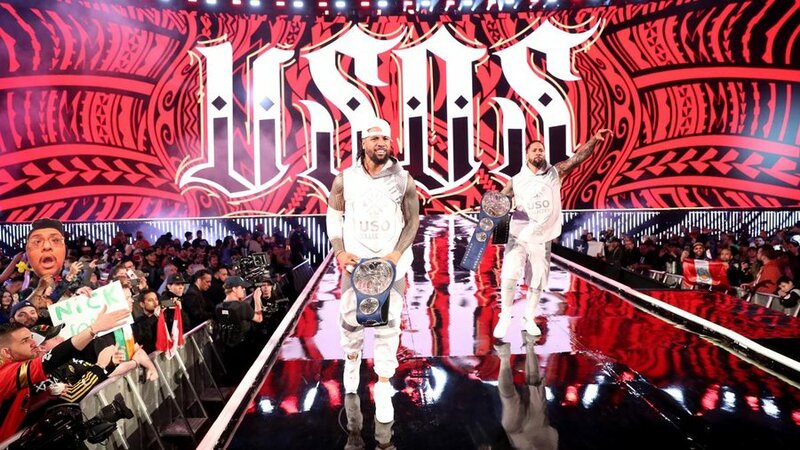 The Usos def. The Bar, Shinsuke Nakamura & Rusev, and Ricochet & Aleister Black to retain the Smackdown Tag Team Titles. Aleister Black’s entrance looked amazing in a Wrestlemania atmosphere. He came off like the biggest star in the match. The IIconics def. Sasha Banks & Bayley, Nia Jax & Tamina, and Beth Phoenix & Natalya to win the WWE Women’s Tag Team Titles. Never in a million years did I expect the IIconics to win here. Sasha and Bayley? Yes. Beth and Natalya? Sure. Peyton Royce and Billie Kay? Hell no. That’s not to say they don’t deserve it. But I was just happy to see them have a spot in this match. They’ve been so underutilized since coming up from NXT. They deserved this moment. I’m a huge Hart family mark. But I’ve never bought the “Double Sharpshooter” spot. Even Bret never tried that. Kofi Kingston def. Daniel Bryan to win the WWE World Heavyweight Championship. Definitely the most emotionally charged match of the night. At least up to this point. That crowd desperately wanted Kofi to win the belt. Because they recognize that it’s real. It’s genuine. And what a moment for Kofi, his family, and the New Day. My hat’s off to Daniel Bryan for helping make this happen. AMAZING counter to the double-stomp into the Boston Crab by Daniel Bryan, Never seen that before. Samoa Joe def. Rey Mysterio to retain the WWE United States Championship. The buzz going into this match was that Rey had an ankle injury. So this was probably the best match he was capable of turning in. The upside? Hell of a dominant victory for Samoa Joe. Roman Reigns def. Drew McIntyre. Crowd wise, this was a little bit of a dead match. The story was fine, and McIntyre is an amazing villain. But for whatever reason, this one just didn’t connect. John Cena interrupts Elias with a “Thuganomics” throwback. 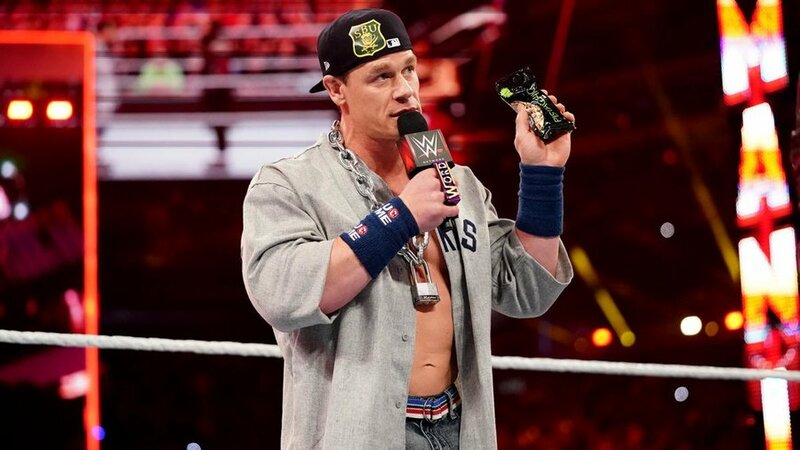 Kinda cool to see retro John Cena out there. Throwin’ out some inside references to boot. As for Elias, working with Cena two years in a row ain’t the worse gig in the world. Triple H def. Batista. It wasn’t until Hunter had the chain around Batista’s face that I noticed his nose ring was still in. And inevitably, you think, “Wouldn’t you try and rip that thing out?” Low and behold he whips out a pair of pliers. And that’s after he almost took a page out of Pete Dunne’s playbook with the fingers. Cool psychology from these two. I don’t think anyone actually thought Batista was winning this one. Especially after the career-ending stipulation was added. Still, all things considered this turned out to be pretty damn good. Slow? Yes. Long? Yes. But still good, in the big picture. Batista looked great, considering he hasn’t wrestled in almost five years. I’d be open to seeing more from the big man, if he decides this isn’t his last match after all. Baron Corbin def. Kurt Angle. This match was about as good as it could be. Lots of people griped about Angle’s final opponent not being someone like John Cena or Samoa Joe. But this was never going to be a mat classic. I can’t say Corbin would have been my first choice either. But to me, this was more story-driven than wrestling-driven. In that sense, Corbin was a fine choice, and the right guy won. 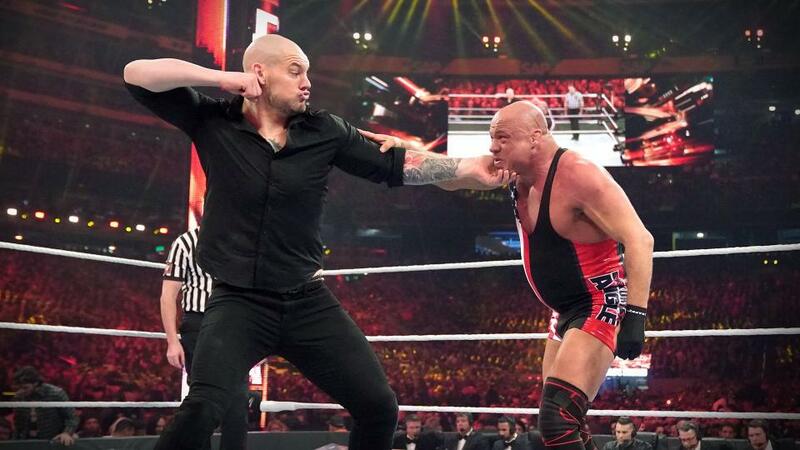 Now, after getting a big victory like this, the big question is whether WWE can turn Corbin into a main event heel. It’s ironic that JBL was the one out there calling the match. Because Corbin has a lot of real heat that’s reminiscent of when JBL was WWE Champion in the early 2000s. At the time, people absolutely hated him. But in hindsight, he was one of the best heels they’ve created in the last 20 years. It’s just a question of whether Corbin has that in him. Finn Balor def. Bobby Lashley to win the WWE Intercontinental Championship. This was more or less what I thought it would be. A buffer match where the Demon gets a quick win. It’s actually kind of like what Balor did with Corbin at Summerslam. Becky Lynch def. Ronda Rousey and Charlotte Flair to win the Raw and Smackdown Women’s Championships. So…either they botched that finish, or they very carefully choreographed that so Ronda would come out of this match as strong as possible. Either way, it puts a bit of a damper on what otherwise would have been the match of the night. These three beat the hell out of each other. In line with what I said earlier, this was the best Wrestlemania main event since Lesnar and Reigns at 31. NASTY fall off the ropes for Ronda after that dropkick from Becky. A little scary, actually. I ain’t a mixed martial arts expert by any means. But to me a Double-Arm-Bar makes as little sense as a Double Sharpshooter. This entry was posted in Wrestling and tagged AJ Styles, Aleister Black, Baron Corbin, Batista, Bayley, Becky Lynch, Beth Phoenix, Billie Kay, Bobby Lashley, Brock Lesnar, Cesaro, Charlotte Flair, Daniel Bryan, Dave Bautista, Drew McIntyre, Elias (WWE), Finn Balor, John Bradshaw Layfield, John Cena, Kofi Kingston, Kurt Angle, Natalya (WWE), Nia Jax, Peyton Royce, pro wrestling, professional wrestling, Randy Orton, Rey Mysterio Jr., Ricochet, Rob Siebert, Roman Reigns, Ronda Rousey, Rusev, Samoa Joe, Sasha Banks, Seth Rollins, Shane McMahon, Sheamus, Shinsuke Nakamura, Tamina Snuka, The Bar (WWE), The IIconics, The Miz, The New Day, The Usos, Triple H, Wrestlemania, Wrestlemania 35, Wrestlemania XXXV, WWE, WWE Women's Tag Team Titles on 04/08/2019 by primaryignition. When I first saw this image a couple of months ago, I didn’t get it. Obviously, it’s an amazing pic from Samia, a.k.a. @everydaylink. 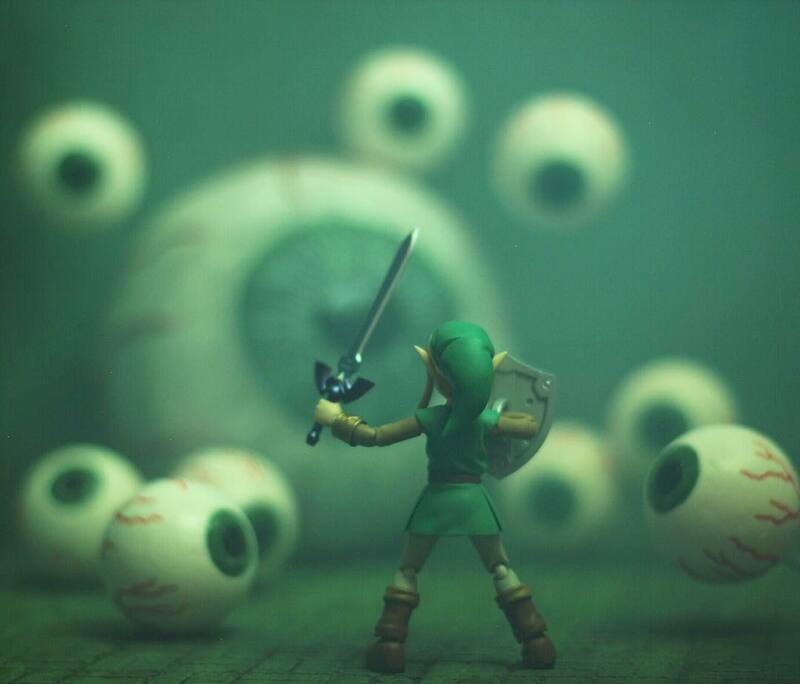 The placement of Link, the creepy and foreboding eyes, the murky green setting. It’s fantastic. Then, Mrs. Primary Ignition got me a Super Nintendo Classic Edition for Christmas. One of the games on it is A Link to the Past. Wouldn’t you know it, eventually I would up eyeing down those same…er….eyes. Actually fighting the eye monster directed me toward an easy-to-miss, but still awesome detail in the image: The ground. When you give it an initial scan, it’s easy to dismiss it as dirt or something. But if you look under Link’s feet, it’s actually flooring. That attention to detail is one of the things that separates this image from the pack. This entry was posted in Toy Chest Theater and tagged @everydaylink, action figure photography, action figures, Instagram, Link, Mrs. Primary Ignition, Nintendo, Rob Siebert, Super Nintendo, The Legend of Zelda, The Legend of Zelda: A Link to the Past, toy photography, toys, Zelda eye monster on 03/09/2019 by primaryignition. The Scene: The Gungan army faces the Trade Federation’s Battle Droids on Naboo. I Say: This “primatives vs. the powerful” narrative is something that dates back to some of the early drafts of the original Star Wars. Lucas has said that originally, there was a big battle between Empire and a society of wookies at the end of the movie. Obviously that was changed. But the idea re-emerged in Return of the Jedi, then again in The Phantom Menace, and Lucas finally got his big wookie battle in Revenge of the Sith. For yours truly, Star Wars has served as a bridge into so many things, whether it’s other areas of pop culture, mythology, or in this case history. When you look at some of the circumstances of the Vietnam War and place them alongside sequence like this, it almost becomes an educational tool. This entry was posted in Movies and tagged Battle Droids, Battle of Naboo, Movies, Naboo, Rob Siebert, Star Wars, Star Wars movies, Star Wars: Episode I - The Phantom Menace, Star Wars: Episode IV - A New Hope, Star Wars: Episode VI - Return of the Jedi, The Phantom Menace, Trade Federation, Vietnam War on 02/28/2019 by primaryignition. I’ve had the blues lately. Just one of those things, I guess. One of the ways I cope when I get hit with depression like that is to seek out comedy and humor. For whatever reason, this video of Bill Hader doing impressions in Jimmy Kimmel Live! has been doing the trick for me. Hopefully, if you’ve got the blues, it’ll do it for you too. This entry was posted in Mental Health, Television and tagged ABC, Bill Hader, Bill Hader impressions, Dateline, Dennis Murphy, depression, Finding Dory, impressions, Jimmy Kimmel, Jimmy Kimmel Live!, Josh Mankiewicz, Keith Morrison, Lester Holt, NBC, Rob Siebert on 02/27/2019 by primaryignition. THE SCENE: In the opening pages of this out-of-continuity take on Supergirl, we meet Kara Danvers and her friends. WHY THEY’RE AWESOME: I’m a sucker for body language and certain subtle visual cues. Comic books are, after all, a visual medium. I wasn’t even two pages into Supergirl: Being Super when I found one I absolutely love. The book reestablishes the character as a modern American teenager. One of the book’s best attributes is establishes strong connections early on between Kara and her supporting cast, specifically her friends. One of those friends is Dolly Granger. What I absolutely adore here is how perfectly the art and the caption boxes are intertwined. The one on the left is our set-up, as we get this information about Dolly’s parents. Then we have the reveal of her hair, which beautifully points to her non-conformist streak without saying a single word. We probably don’t even need the caption on the right. But it’s a nice bit of garnish. Incidentally, it’s probably not an accident that the background is rainbow colored. One of the book’s best attributes is how real and genuine Kara’s friendships feel. They work wonders in making this otherwise goddess-like character feel very down-to-Earth. Often it can be cumbersome to get those supporting characters established while still doing the business of the plot. But Dolly’s introduction is quick, seamless, and masterful. For more Joelle Jones, check out Panels of Awesomeness: Catwoman #1. This entry was posted in Comic Books/Graphic Novels, Panels of Awesomeness and tagged comic book reviews, comic books, DC Comics, Dolly Granger, Dolly Parton, Joelle Jones, Kara Danvers, Kara Zor El, Kelly Fitzpatrick, Mariko Tamaki, Panels of Awesomeness, Rob Siebert, Saida Temofonte, Sandu Florea, single issue reviews, Supergirl, Supergirl: Being Super, Supergirl: Being Super #1 (2016), superheroes, teenage superheroes on 02/25/2019 by primaryignition. I’m not sure you can pack more action movie style fun into an image than Doctor Van Nostrand did here. Firstly, you’ve got the simple fact that it’s Deadpool vs. Wolverine. They’re two of the most popular anti-heroes in all of comics, and both of them essentially have “I don’t die” super powers. They could literally fight forever. All the Hugh Jackman jokes in the Deadpool movies don’t hurt either. Then there’s the pose. 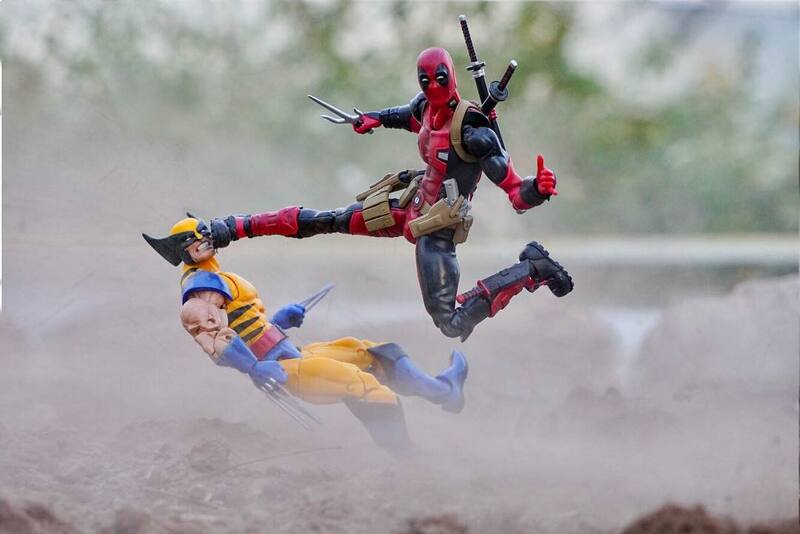 A perfectly serviceable kick to the face, supplemented by the scrunched up angry face this Wolverine figure has. From a distance, it creates a great illusion of impact. This is a gorgeous setting too. The kicked-up dust gives subtle impression that they’ve been scuffling for at least a few minutes. We’ve past the initial explosion of the fight. But what seals the deal for yours truly is a detail you might miss if you’re simply scanning the image quickly. (Or maybe I’m just ADD like that.) Deadpool’s face is turned toward the camera, and he’s giving the audience a thumbs-up with his left hand. Thus, this image not only created a dynamic action pose, but a scene that’s perfectly suited to Deadpool. Frankly, just looking at it makes me hungry for a chimichanga. This entry was posted in Toy Chest Theater and tagged action figure photography, action figures, Deadpool, Deadpool vs. Wolverine, Doctor Van Nostrand, Logan, Marvel, Marvel Comics, Marvel superheroes, Marvel toys, Rob Siebert, Toy Chest Theater, toy photography, Wade Wilson, Wolverine on 02/24/2019 by primaryignition.